We are often contacted by people who want to know what they can do to help. The two most important things you can do are free and can be done from the comfort of your own home. 2.) Contact your Federal and State Representatives/ Senators on a regular basis and let them know that you support reform of marijuana laws. It may also be benificial to let them know that you vote for candidates who suport reform as well. 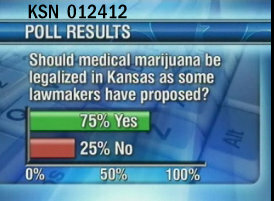 A 2012 poll conducted by KSN3 shows a 75% approval raiting by citizens of Kansas for legalization of medical marijuana. Contact your Representatives/ Senators today and let them know you are in the majority. Find talking points and contact information for your represntatives when you click here to connect by phone with your senators, or here to write to them. Click here to connect by phone with your representative, and here in writing. Here is a listing of people in the House Committee on Agriculture. These are the people who decide whether the Industrial Hemp bill stays on as part of the legislation. They need to hear how important this measure is for our economy and environment.